I love this idea of integrating candles to your cake design! Never know how to incorporate candles to your cake without distroying the look, well this is a great way to do it! Just follow my steps and you will see how easy it is to create this cute Caterpillar candle cake topper. This can be made with fondant or even gumpaste. For more ideas on cake decorating Subscribe to my Youtube channel for FREE by simply following the link below. Using yellow fondant, make small round ball shapes. The number of shapes should equal to the age of the child. 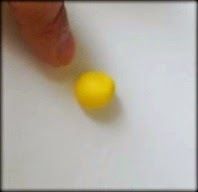 Exemple: if the child will be 4 years old you would make 4 yellow balls. Create a crease in the middle of each yellow balls by inserting any color candle you want in the middle of each and one of them. Then, pull the candle out and brush a small amount of water in each creases by using a clean brush. (water and fondant will create glue) Once water brushed in to each vrease, re insert your candle so that it sticks with your fondant. Using green fondant, glue 2 small round pièces on each side of the shape created on step 2. 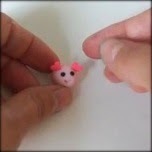 Using a light shade of pink fondant, roll out the same size and shape as step 1. Then, using a round tool or the opposite end of a piping nozzle, scare the fondant half a circle to create a smile. 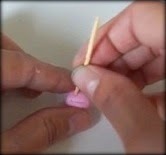 Using a toothpick poke two holes. Then, roll out two small black fondant pièces and glue them using a clean brush and a small amount of water in the creases created. 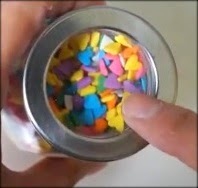 Glue two small heart shape candies on each side using a small amount of water. Glue all your pieces on your cake board using a small amount of buttercream Under each piece and VOILÀ! Click here for a better visual.